INDIANAPOLIS, May 8, 2018 – USA Gymnastics Trampoline Development Center Coordinator, Joy Umenhofer, conducted her first 2018 site visits at Platinum Sports Center in Simi Valley, Calif., April 19-21; Desert Gymcats Flip N Twist in Las Vegas, Nev., April 22-24; and Legacy Training Center in San Luis Obispo, Calif., April 26-28. 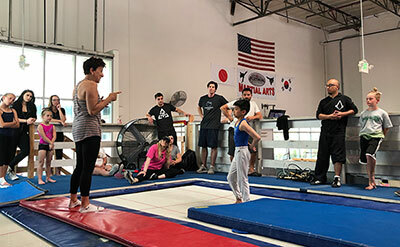 As part of the Trampoline Development Center (TDC) program, Joy Umenhofer makes three visits to each selected club to educate the gym, its coaches and athletes about trampoline. When Umenhofer visits the selected TDC clubs, she hosts clinics to educate club staff on scheduling, coaching and teaching trampoline, basic skills, conditioning, flexibility, and progressions; talent identification development programs; and interactive coach and athlete training sessions. Each club also receives marketing materials, operational guidelines and curriculum support. In addition, other clubs in the area are encouraged to attend the coaching education sessions to learn about expanding their programming to include trampoline. Platinum Sports Center and Desert Gymcats are both members of the TDC program, while Legacy Training Center has been designated an Elite TDC. Once a club has gone through the initial TDC program, they are eligible for the Elite TDC program. The Elite TDC consists of two three-day visits, with one day designated to a free workshop. Classroom presentations include training plan development, athlete leadership, coach leadership, club administrative guidance for a healthy successful team, skill/drill/sequence techniques, and routine construction. Hands on training sessions cover spotting, drills, sequence, routines and more, with athlete’s who participate in level 8 and above. Member clubs of USA Gymnastics are eligible to apply for the Trampoline Development Center program, and to be eligible for the Elite TDC track, all clubs must have gone through the original TDC program and have athletes participating in level 8 and above. Additional information and the application are available online at usagym.org/tdc. Athletes of all ages and body types can enjoy and benefit from trampoline, which also enhances skill development across all gymnastics disciplines. Trampoline may also retain athletes who are looking for something different from gymnastics or need to adjust to accommodate outside scheduling challenges. Additionally, the artistic gymnastics and trampoline competitive seasons complement one another, which makes it is possible for an athlete to participate in both. 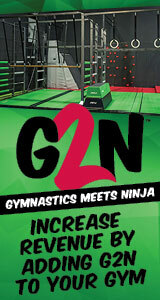 Many gym clubs in the U.S. already have trampoline as part of their programming, which has proven to be very successful.